London may be the focus of public diplomacy attention and reap the greatest benefit; however, all countries are likely to seize and squeeze what public diplomacy mileage they can when the international spotlight shines in their direction. When you watch, watch for the cultural cues. Some of the most prominent cultural cues reside in the selection and use of color. 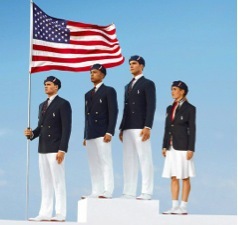 The significance of color begins with the Olympic icon itself. The colors of the five interlocking circles –blue, yellow, black, green, red –against a white background contain the colors of the flags in the family of nations. Color also plays a dominant symbolic role in the uniforms and dress of the athletes. 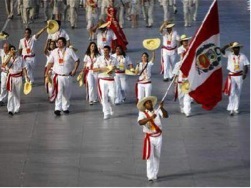 During the Parade of Nations, one may find a stunning variety of national costumes but a clear pattern of close color parallels between what the athletes are wearing and the flag they are bearing. The team below is from Peru. 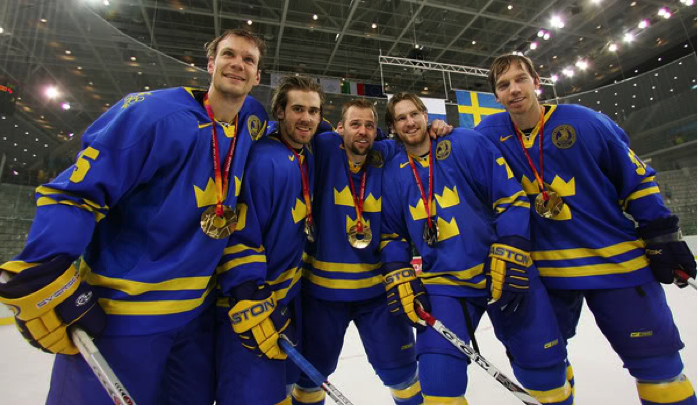 The parallel color theme between flag and dress carry over to the athletes’ uniforms: one can see the blue and gold flag of Sweden behind the group photo of its winning team. Some athletes are literally are wrapped not only in the colors of their flag, but also the signature design. Members of the South African team will probably not be hard to identify in London. In addition to being dressed in the colors of their countries, the host country may clad the athletes in additional Olympic touches. 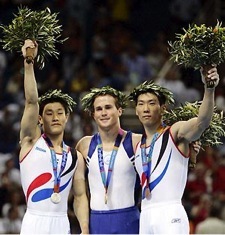 Athens, host of the 2004 summer Olympics, added classical wreath garlands for medal winners. It is not just color that makes athletic uniforms symbolic. 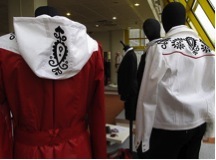 Watch for small national touches such as the Kalotaszegi folk motifs on this year’s Hungarian uniforms. While such detail may be lost on the international community, to the home crowd they can carry enormous weight. The initial discontent among the American public with the U.S. team’s uniform was with the hat, which resembled a “French beret”. Many suggested a cowboy hat or baseball cap would have been a better choice. The symbolism is not only on the outside. The inside tag revealed that garments for the U.S. team were “Made in China.” Another uproar ensued. Aesthetic appeal is often related to what is culturally familiar as well as culturally prescribed. This year the issue over what to wear has brought special attention to female athletes. And, here we get into some controversial territory when it comes to dress codes that require covering – and uncovering – the female body. In conducting research for this post, I was surprised by what I discovered. But then, when I remembered that international sports coverage is a multi-million dollar venture, perhaps I should not have been. The various sports have international committees that set the official dress regulations. Safety of the athletes has been a prime concern, hence the banning of scarves around the neck or long necklaces. However, the question of how to dress the female athlete extends into the cultural domain. Earlier this spring, both the Badminton World Federation and the International Amateur Boxing Association introduced dress codes requiring female athletes to wear skirts or dresses. The rules were proposed “to improve the image of the sport and increase sponsorship.” Many athletes and critics called the new regulations “sexist.” The rules were dropped. I was aware of the Islamic prescripts for female dress in public. “Modesty” is a fundamental principle in Islam that extends to words and action as well as dress. Many Muslim female athletes train and compete with their hair and body covered. In 2004, Roqaya Al Ghasara from Bahrain was the first to compete in Islamic dress. In 2008, she finished first in the women’s 200m sprint. Not coincidentally, Women’s Beach Volleyball is one of the highest rated women’s sports for viewers and among the most coveted tickets. This year the rules were changed, according to officials, because countries had “religious and cultural requirements.” The Australian government has raised concerns of “sexploitation,” or the use of women’s bodies for marketing and media purpose. The new volleyball dress code allows for “shorts of a maximum length of three centimeters (1.18 inches) above the knee, and sleeved or sleeveless tops." Shorts are still short of full coverage. This causes problems for female athletes who are caught between Islamic codes requiring them to cover their bodies and the various sport dress codes requiring them to be uncovered. 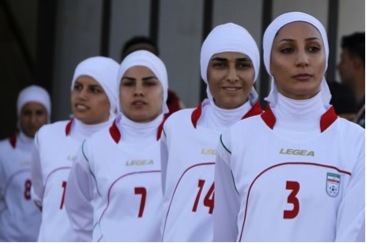 The Iranian Women’s Soccer team faced such a catch-22 situation and will not be able to participate because of the debate over their uniforms. The debate over what female athletes wear – and cannot wear – does not appear to be about sport competition, safety, or their ability, but cultural ideas about what how best to dress the female body in public or for the camera. Music is also another broad area of cultural symbolism that runs throughout the Olympics. The national anthem is played during the awarding of medals for the individual athletes. The Olympics has its own official hymn. 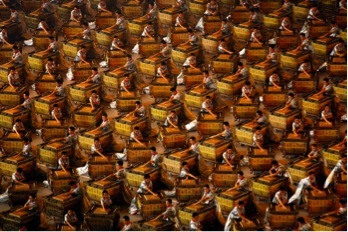 Seeing the 2,008 drummers countdown to the 2008 summer Olympics in Beijing was one of the most memorable moments of Olympic symbolism. It is still stunning to watch the video. Gestures are also highly symbolic. 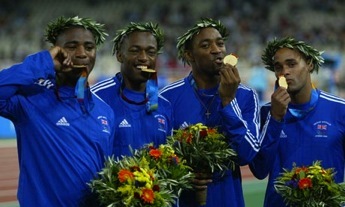 Kissing the gold may be a universal sign for the sweet reward of victory. Perhaps the most powerful gestures are not universal, but still recognizable. Again, what might be lost on the global audience can have a powerful political statement for the national public. 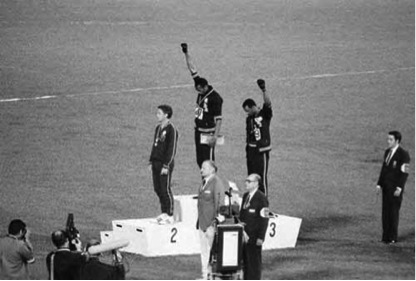 During the 1968 summer Olympics in Mexico – a time that coincided with the civil rights movement in America – two U.S. athletes raised their arms as a symbol of defiance black power and lower their heads as the U.S. anthem was played. The Olympic games represent not just a public diplomacy opportunity for the host country. It is a pageantry of powerful symbols for all nations and participants. So when you’re watching, enjoy and keep an eye open for the many unspoken cues. very informative post for us. thanks for sharing with us.